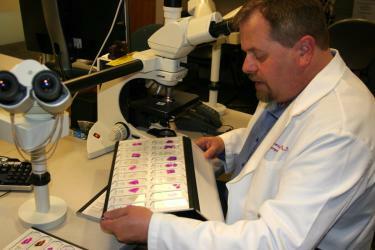 Dr. Dirk Keene, Leader of the UW Alzheimer’s Disease Research Center (ADRC) Neuropathology Core, studies the plaques and tangles of brain disease under the microscope lens. He searches for the consequences of traumatic brain injury (TBI), in order to confirm a possible link to later dementia in the aging population and chronic traumatic encephalopathy (CTE) in football players. This Q&A dives into recent, and surprising, findings in his field. How have you recently investigated the link between traumatic brain injury (TBI) and dementia risk in neuropathology? UW researchers and scientists from around the country can access a unique and powerful resource, the Adult Changes in Thought Study (ACT), which a 30-year longitudinal study on aging in which some participants donate their brains for research. The ACT study, based in the Group Health Research Institute (GHRI), has now followed over five thousand people, age 65+, from the community to track the development of chronic diseases and dementia. The idea is to look for factors, including head injury, that influence the risk of cognitive decline or dementia in a sample that represents the general aging population. With our colleagues at the Allen Brain Institute, UW Medicine, and GHRI, the UW ADRC Neuropathology Core team evaluated brain tissues from ACT study participants who had died to create a new and publicly available databank resource for studying the later effects of TBI in the aging brain, called the Aging, Dementia, and TBI Study. We examined brains from 55 ACT cases with a TBI with loss of consciousness and 55 matched cases without a similar history of head injury, in order to evaluate for classical brain pathology such as Alzheimer's and Parkinson's disease. In addition, we examined the same tissue for changes in gene expression and biochemical and molecular changes in order to be able to identify other TBI-related changes that may not be obvious with traditional neuropathology. Our team selected the cases, collected and divided the tissue for analysis as UW and the Allen Brain Institute, and characterized the signs of disease in the tissue. The methods developed for this study potentially represent a whole new way of human tissue analysis for neurodegenerative disease. Traditional neuropathology characterizes the amount of pathology related to Alzheimer's, Parkinson's, and other diseases. In this study, in addition to these measurements, we performed multiple diverse tests on the same pieces of tissue from each brain region of interest. This represented an enormous investment from the Paul Allen Family Foundation and required dozens of scientists and technicians to implement. In conjunction with leading neuroscientists at the Allen Brain Institute, we quantified gene expression, markers of immune and oxidative stress, and other measures that can tell us about the disease state of brain tissue. In addition, each case comes with de-identified clinical data collected in the ACT study. It's a uniquely rich dataset to discover any long-term effects of TBI in the brain. Have you found a TBI-dementia link in this UW Medicine-Allen Brain Institute resource? And what does this project make possible for scientists? So far, we haven’t found any signal of a significant link between a TBI with loss of consciousness and Alzheimer's disease. It's important to keep in mind that the ACT study enrolls people in the Group Health Cooperative in Washington State who make it to the age of 65 without developing dementia. The bottom line is that people who reach 65, and who have had a serious whacks to the head earlier in life, have the same risk of Alzheimer's disease as someone without a TBI. So, I think that’s good news. However, we could be missing something in all that data, and we are still working on analyzing other measures. Further, researchers can now ask questions that they couldn’t have asked before. Any scientist from around the world can visit the Allen Brain Institute web resource and draw from this data gold mine of well-characterized tissues to answer a question about the role of a certain gene in the aging brain, for example. I hope that researchers check out this new resource because I think the best way for us to learn about these cases is for other people to study them with different perspectives and hypotheses. The more we interact and the more we understand what others are doing and how they are thinking, the more ideas we’ll have and the better we’ll be able to learn from this tissue and these people. Unlike the general population, scientific evidence suggests that football players with multiple hits to the head risk developing a neurodegenerative condition called chronic traumatic encephalopathy (CTE), which may lead to behavioral problems and dementia. In 2014, you were one of seven neuropathologists called to serve on the first NIH national consensus forum on CTE in Washington D.C., supported by the Foundation for Sports Health Research Program and the National Football League. What came from this effort? 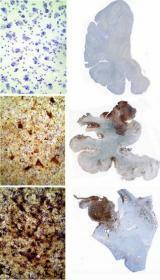 The panel established that the pattern of tau protein pathology of CTE is distinct from patterns characteristic of other conditions, such as Alzheimer disease or frontotemporal degeneration. We identified criteria for detecting and defining CTE in the brain, which will help clarify how many football players develop the condition and, thus, the true implications for sports. The criteria will also help researchers diagnose signs of CTE in living athletes, using PET scans that are currently under evaluation for this purpose. A visualization of tau tangles (brown) in postmortem brain tissue of selected professional football players. Courtesy Ann McKee. It is critical to note that we analyzed brain tissue samples from athletes with known histories of brain injury. To determine the true prevalence of CTE, researchers need to look through the brains of controls, or people who haven’t been selected for research because of concerns of CTE during life. We can’t talk about the specificity of the relationship of repetitive head trauma to CTE pathology until we’ve looked in places where we don’t expect to find it. And once we do find it, we have to decide if it’s really related to past neurotrauma, or not. Since then, we have done just that. 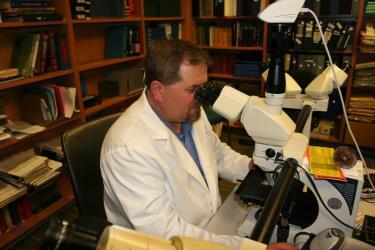 Our neuropathology team has looked for CTE in brains in the ACT Study. We aren’t finding much, but that may be because people who actually have CTE likely do not reach age 65 without dementia, and therefore wouldn’t ever make it into our study. In ACT participants, TBI exposure comes mostly from falls, bike or car crashes, and injuries in a subset of military veterans. Our next step is to look through our cohort in the UW Alzheimer's Disease Research Center, which contains people of any age and a variety of different neurodegenerative processes, some of which could very well be CTE. Excitingly, in collaboration with the local Veterans Affairs health-care system, we have just opened the Pacific Northwest Brain Donor Network to investigate the long-term neuropathological effects in service men and women exposed to blast injuries in Iraq and Afghanistan. What more do you want to know about CTE? We don’t know enough about the relationship between CTE pathology in the brain and the development of clinical symptoms during life. It might be a similar situation to Alzheimer's disease, where some people have Alzheimer pathology in their brains but show resilience to developing symptoms. Plenty of football players do seem to escape CTE symptoms. For example, Alan Page is a Hall of Fame defensive tackle who played with the Minnesota Vikings and Chicago Bears for 14 years, earned a law degree, and served as a Minnesota Supreme Court Justice for 22 years until he reached the Court's mandatory retirement age of 70. My point is that we don't know how many football players or other athletes have or will develop CTE, and how often changes in the brain caused by CTE result in alterations in behavior or cognition. Many parents are understandably concerned about what this research means for their kids who play school sports and get concussions. What is your perspective? In our research in the ACT study, we are finding that a single TBI with loss of consciousness does not increase risk for later Alzheimer disease-type pathology and dementia. That's a negative finding, but I think it's really important for people to know that a mild to moderate TBI doesn't necessarily mean long-term repercussions. The bottom line is that people who reach the age of 65, and who have had a serious whack to the head earlier in life, have the same risk of Alzheimer disease as someone without a TBI. So, I think that’s good news. The Aging, Dementia, and TBI Study at the Allen Brain Institute, a new open-access data resource for researchers. TBI Research at the ADRC, an overview of work done by ADRC's Dr. Elaine Peskind and Dr. Murray Raskind. The Seattle Times announces the opening of the Pacific Northwest Brain Donor Network, an UW ADRC effort aimed at understanding the impact of mild traumatic brain injury (mTBI) on active-duty military members and veterans. 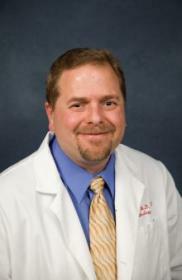 Learn about the leadership, mission, and history of the UW Alzheimer's Disease Research Center. McKee et al. The first NINDS/NIBIB consensus meeting to define neuropathological criteria for the diagnosis of chronic traumatic encephalopathy. Acta Neuropathologica. Volume 131, Issue 1, 1 January 2016, Pages 75-86.